When Astrid wakes up the next morning, she’s surprised that Thomas isn’t around, but it isn’t until she receives a call from his work that she begins to worry. Lying to his secretary, and then to the children, she starts to go over possible scenarios in her mind. The car hasn’t been taken, his clothes are all still in the bedroom; surely he can’t have gone far? As the hours stretch into days, Astrid knows that she needs to involve the police – but what if Thomas doesn’t want to come back? 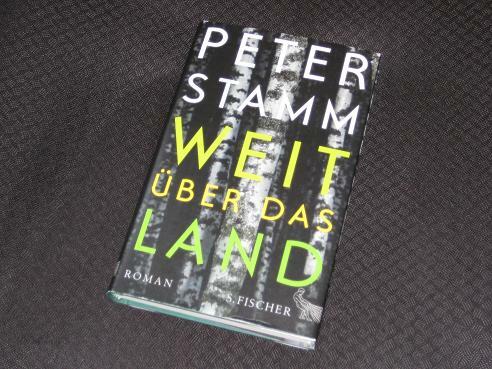 The need for escape is never far from the surface of Stamm’s work, but Weit über das Land takes this to extremes, taking the reader along for a ride (or, rather, a walk) with a man who has simply decided he needs a bit of fresh air. Thomas’ decision to leave seems as much of a surprise to him as to us, and his initial wanderings through the local fields and hills appear aimless and self-destructive. It’s only when time provides a little perspective that he begins to seriously consider his path, taking the risk of using his credit card, briefly revealing his location before preparing to vanish for good. Was soll ich machen?, fragte sie ihn nur. Willst du, dass ich dich suche? Dass ich dir nachgehe? Wartest du irgendwo auf mich? Oder soll ich tun, als sei nichts geschehen? Brauchst du Zeit? Wieviel Zeit? Er gab keine Antwort. Interestingly, her bewilderment never gives way to rage. Where most people would blame their partner for running away, Astrid begins instead to look back on their relationship, hunting for signs of failure and wondering whether she ever loved him enough. Meanwhile, out on the wiley, windy moors alpine meadows, Thomas has no time for such musings. His struggle is far more existential – with the weather changing, his desire to keep far away from other people means that the journey becomes ever more difficult. In this part of the novel, Stamm depicts the landscape of his native region, with the text becoming much more descriptive than psychological. Having left society behind, Thomas’ only worries are immediate: finding water, making it to the top of the next hill, looking for something to eat. If he fails to achieve his goals, he might just be stranded above the snow-line forever. But does he really care? Weit über das Land is an excellent read, consisting of two completely separate strands, with very little overlap (with minor tinkering around the edges, it could almost be read separately as two connected novellas). A book of gaps, it forces us to read between the lines in the hope of getting to the heart of Thomas’ behaviour. We ask ourselves what (if anything) happens in the old house Thomas stumbles across near the start of his travels and wonder if the apparently idyllic holiday the family had just shared was so perfect after all. Is this just a mid-life crisis, or is there more to Thomas’ decision than he (or Stamm…) is letting on? Of course, this isn’t the first time the writer has examined the desire to escape that lies within us all. In Ungefähre Landschaft (Unformed Landscape), the main character, Kathrine, does something very similar, fleeing her smothering husband and the small Norwegian town she grew up in. Similarly, Stamm loves to return repeatedly to the theme of relationships in crisis (c.f. Agnes, Sieben Jahre (Seven Years)), seemingly specialising in stories of couples falling apart. What comes across in all these works is the way in which an outwardly happy existence can crumble almost from one moment to the next, the writer expert at emphasising the fragility of a ‘comfortable’ life. As time goes by, and the chance of her husband’s return becomes ever less likely, poor Astrid must face up to the possibility that theirs was a life Thomas never really wanted at all. Oh, this sounds rather wonderful, Tony. I’ve got about three Stamm’s in my TBR but I’ve still not read him, but this one in particular sounds like my cup of tea. Kim – Definitely worth a try. I love his simple style (I think this is the seventh one of his I’ve read…). Of course, you may have to wait a couple of years for this one! I have just read Unformed Landscape written by Peter Stamm in 2004. I read it in English. As you describe here it is about a woman leaving restricting circumstances in a quest for identity. I thought the writing quite uneven, with sentences beginning with ‘she felt’, and at the end of the book the whole of her life is telescoped into ‘this happened’ then ‘that happened’. Not as good as my usual Norwegian authors. Would like to hear your opinion if you have read it. Gert – While I wouldn’t say ‘Unformed Landscape’ is his best work, the language you describe is quite deliberate. Stamm makes it very clear in all his books that the writer (or narrator) is examining these people and describing them dispassionately, and the language used (including subjunctives in German) reflects this. The ‘telescoping’ comment is interesting because he does the same thing in this one (I can’t remember if it comes up elsewhere) – I suspect it’s another deliberate technique to allow him to show the eventual consequences of his characters’ actions without simply jumping ahead. Thanks Tony. I’m trying to resurrect my German but not quite up to the subjunctive yet. I’m sure it’s whole different experience reading in the original language.